Writing with tremendous empathy, Meissner shows how a family is transformed by tragedy and hope during the 1918 influenza pandemic. Pauline Bright has finally made her peace with death after the passing of her infant son, Henry. When her husband Thomas agrees to take over his elderly Uncle Fred’s mortuary business in Philadelphia, he sees it as an opportunity to improve their circumstances. For Pauline, though, their big-city move and new profession are a natural progression for her ongoing grief. She and her three daughters narrate in turns, in styles fitting their ages and personalities. Evie, fifteen, loves books and learning and develops a fond attachment to a fellow student. Twelve-year-old Maggie, full of curiosity and youthful eagerness, has a huge crush on an older male neighbor who’s about to leave for war. The chapters from six-year-old Willa are realistic in their innocence and brevity. Kept away from the dangerous chemicals in the “Elm Bonning Room,” Willa makes friends at school, but peer pressure makes her avoid a German-American classmate without knowing exactly why. Meissner shows the impact of larger events via more intimate moments. In September, the Brights attend the Liberty Loan Parade, a massive public event that serves to spread influenza. Soon, the disease lands on their literal doorstep, changing their respectable home and business into a processing site for the newly dead. At this height of emotional turmoil and sorrow, one split-second decision—the rescue of an orphaned boy—gives them the strength to carry on but has repercussions. This affecting portrait of our grandparents’ and great-grandparents’ time feels authentic, from Philadelphia’s extensive streetcar system to the brazen sounds of Prohibition-era speakeasies. Its touching story of mortality, love, and grace will also have readers pondering the many forgotten lives that the Spanish Flu snuffed out too soon. 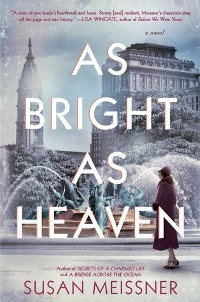 As Bright as Heaven is published today in hardcover & ebook by Berkley; I wrote this review for February's Historical Novels Review. This year marks a century since the influenza epidemic of 1918-19. Reading this novel gave me a sense of what it was like to live through those traumatic circumstances. A tough time - our family lost a great-aunt to the flu epidemic in Cleveland in 1919, leaving her four children 12, 10, 7 and 2 without their mother. Thanks for the review! That is very sad, and tough for the family. When I was tracing my family history, I learned that my great-grandmother's sister lost four children to the flu in the space of a week. This was also in the Midwest (Michigan) in 1919. It took a while to locate the records because I'd been looking in the wrong year. I didn't learn about this epidemic until I was close to 40 years old. I'm amazed that it isn't more general knowledge. This books sounds really good! It's true it isn't as well known as it should be given the number of people who died from flu. I was also wondering why that is. It could be that it was so traumatic that families didn't talk much about it afterwards. It wasn't something I grew up hearing about.